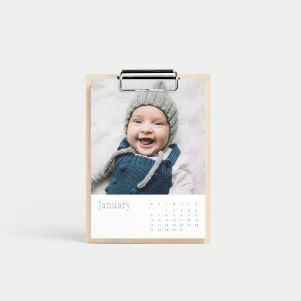 Stay organized in style or give a gift that lasts year-round – our line of custom photo calendars includes a variety of designs perfect for wall or tabletop display. Each of our calendar options is printed on premium Mohawk paper – a family-owned company renowned for their commitment to quality. From minimal and sleek to more classic appeal, you’ll be sure to find design options you or your lucky recipient will love. 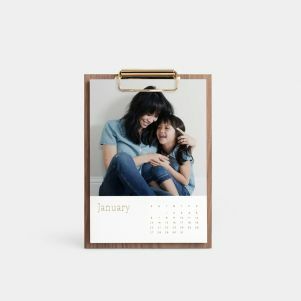 Our Wood Calendar is handcrafted from reclaimed beetle pine and fastened with a simple metal clip. 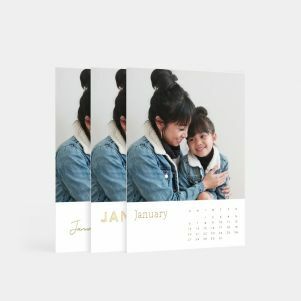 With one calendar print for each month of the year, just upload 12 of your favorite photos and flip through them with each passing month. On the back you’ll find a magnet for displaying on your fridge or any other magnetic surface. Similar in design, our Solidwool Calendar features fleece from upland UK sheep. This beautiful composite material showcases the delicate wool fibers – each calendar is different and perfectly unique. 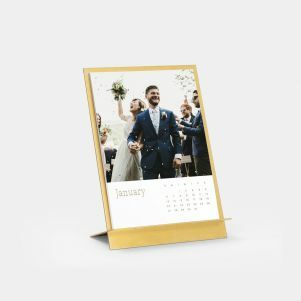 Our best-selling Brass Easel & Calendar is your desk’s best look yet. Crafted in the USA from solid brass, this easel is the ideal home for your favorite images. Choose from Classic, Modern, or Simple calendar designs to suit your style. Need a new year’s worth of calendar prints, but already have your calendar? Purchase a Calendar Refill Pack to pair with our Wood Calendar, Solidwool Calendar, or Brass Easel & Calendar. New for the year, our 2018 Foil-Stamped Annual Calendar is a stand-alone art print that will keep you up-to-date, too! Printed on one of our premium Large Format Prints, this Artifact Uprising exclusive includes copper foil and space to fill in your year’s intention. To finish the look, pair your calendar with our Wooden Print Hanger for an elevated display. 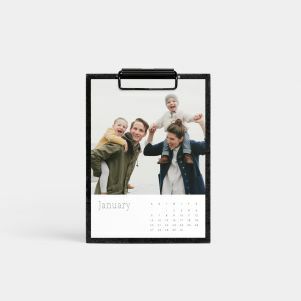 Fastened with brass screws, easily slide your calendar print inside and enjoy year-round.